SOLD SOLD SOLD A great opportunity to purchase a very large studio apartment in the first row by the sea in Baošići village, Herceg Novi, Montenegro. Fabulous views of Boka Bay and Mount Lovćen from the apartment’s balcony. There is a lovely beach just outside the apartment and the village centre with all the amenities is only 3 minutes walk away. Tivat airport is only 40 min drive away, and Kotor about 30 min drive away. The studio comprises a large room and bathroom, as well as a small kitchen. 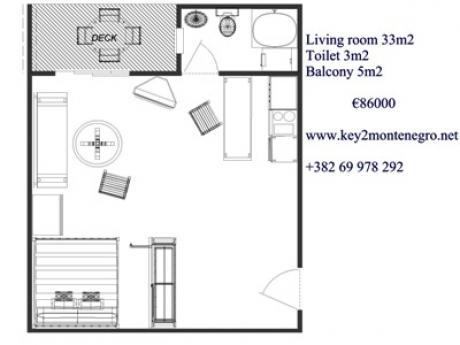 The total floor area of the apartment is 41m2, plus the balcony. There is a good rental potential from May to October. Furniture is included in the price: €65000.